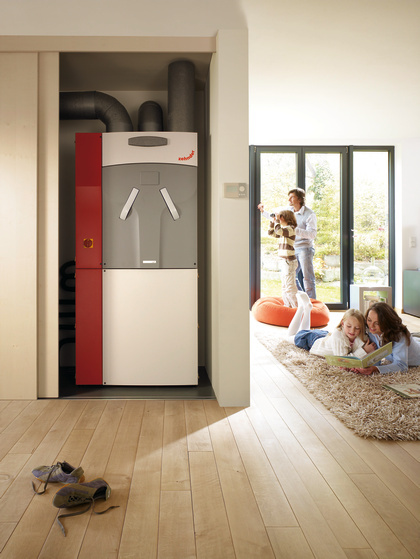 The Zehnder ComfoBox is a combination whole house heat recovery ventilation device and ground source heat pump. This allows one unit to provide heating, cooling, ventilation and hot water for a residential dwelling. 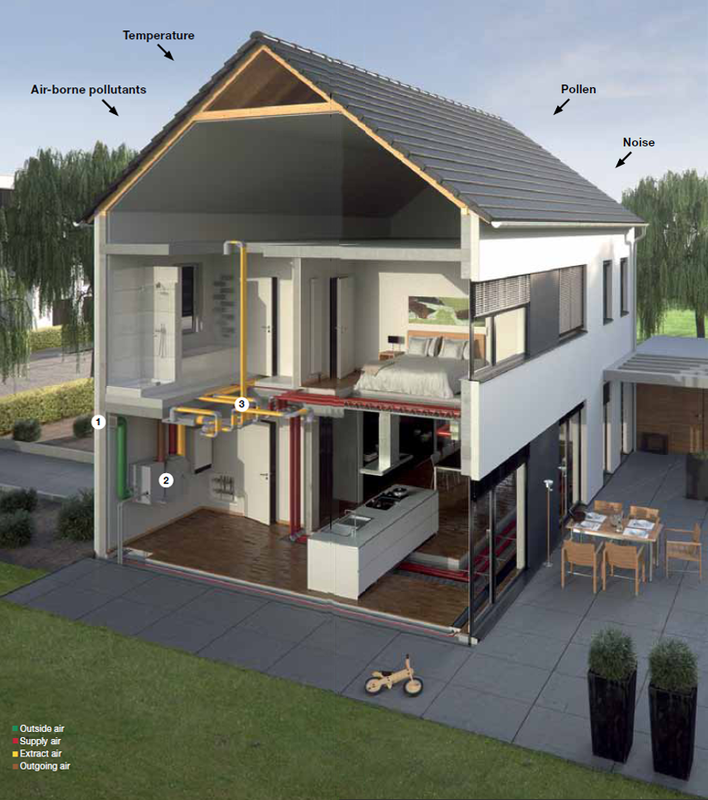 The heat recovery unit works to minimise heat loss through ventilation while the ground source heat pump uses the natural store of energy in the ground and converts it into useful energy to heat the home. b. After being pre-cooled or pretempered by the earth via a ground source heat exchanger (ComfoFond earth-air and earth-brine options are available). The Zehnder Comfosystems ComfoAir unit is continuously extracting moist and stale air from the dwelling’s wet rooms (kitchen and bathrooms). This extract air is passed over the unit’s heat exchanger where up to 95% of the heat which would otherwise have been exhausted to the atmosphere is recovered. The recovered heat is then used to pre-temper incoming, fresh outside air which can be additionally humidified, dehumidified, heated or cooled depending on the options chosen. Fresh outside air is then delivered as supply air to habitable rooms around the house via an air distribution network. The volume of extract and supply air is adjusted on a room by room basis to conform to Building Regulations and to create a balanced system. The Zehnder ComfoFond-L earthbrine ground source heat exchanger uses the relatively constant annual temperature of the earth at a depth of one to one and a half metres. This ‘passive store’ of energy remains at a temperature of 10 – 12°C all year round and can be used to temper incoming supply air in winter months and cool air in summer months. A brine filled ground loop is buried one to one and a half metres below the surface of the ground. The temperature of this brine is then modified by the temperature of the surrounding earth. This brine loop is connected to the ComfoFond-L which draws air in through an external wall. The heating/cooling energy of the brine loop is then passed to this air. The air is then filtered and passed to the inside of the dwelling via the whole house heat recovery ventilation unit. The ComfoFond-L is an easy to install ground source heat exchanger, which makes it suitable for a wide range of property types. 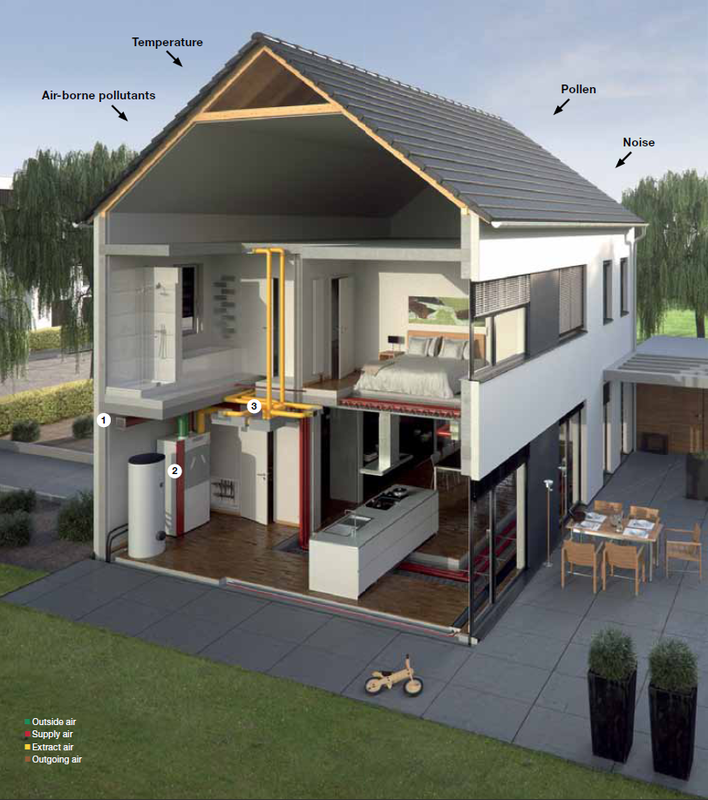 The illustration below shows the optional Zehnder ComfoFond-L ground source heat pump in use with a whole house heat recovery ventilation system.